Abacus Data has stepped forward with a new poll for the New Brunswick provincial election. The poll was taken in only part of the province, however. 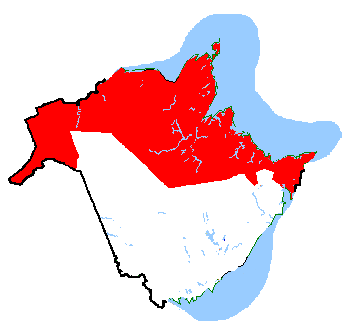 The geographical extent of the poll was four federal ridings as depicted in the map below: This region corresponds roughly, but not entirely, with the francophone part of the province. As this blogger explains, these four federal ridings encompass all or most of 22 provincial ridings. Considering that the sample size is 518 people, we're talking an average of about 24 people per riding sampled. It would be difficult to extrapolate this poll to mean anything in these 22 individual ridings, especially considering that the swathe of territory included is far from monolithic. Nevertheless, it is good to have some other numbers. According to the calculations of the blogger linked to above, this 42.5% result for the Progressive Conservatives represents a drop of about three points from the 2006 election - well within the margin of error of 4.4 points. The Liberals have dropped eight points to 41.3%, a significant factor in what is traditionally a well-performing region for the party. The New Democrats are the beneficiary, as they are up about eight points to 12.5%. We must conclude that Roger Duguay is a big part of that NDP swing, and so it puts him in a good position to win his riding of Tracadie-Sheila. The other parties are at 3.8% in the region. Interestingly, the Progressive Conservatives have relatively similar numbers among all age groups - except those aged 18 to 29 (who don't vote in great numbers anyway). The Liberals also don't seem to have strong support in any one group, but they are low among those aged 40 to 59. The NDP is doing very well in the 18-29 age group, which is not a good sign for election day. This poll doesn't exactly confirm the big PC numbers we've been seeing in the TJ/CRA polls. We should see the Progressive Conservatives doing better than their 2006 performance - that is, of course, unless they are doing very well in the other half of the province. It does confirm Liberal weakness and (relative) NDP strength. If the Progressive Conservatives make good inroads in this part of the province, David Alward can be pretty confident that he will form the next government.